Your parents sound awesome. Can't wait to read the story in the paper. Your dad, from what I remember, has been pushing Honest Ed's forever. Why did you buy wash cloths from the Bay? You can buy 20 from Honest Ed's for a $1 and they'll last you 30 years! Classic advice from a classy man. Your dad sounds like an awesome person. No wonder you turned out so nice CJ. Better than 99% of the idiots on GO. I'm hoping Honest Ed's isn't sold to asians or a dollar store type place, as they would just ruin it. Here's hoping it's sold to someone who knows the true love that Ed put into that store, and continues to pour their love into Honest Ed's for another half century ... or more. My parents are very special to me. I'm glad I have them. What do you mean, sold to Asians??? Please explain. Danmit, I wish my dress shoes would last 50 years... I get two years, max, out of a pair. Honest Eds and the entire Mirvish Village are being sold for redevelopment. Very nice story CJ, your dad must really take care of his belongings for those shoes to last this long. I just hope whomever buys it doesn't tear it down to build condos, I am sick of condos. Too expensive and they are isolated so you can't walk anywhere near them unless you own one or are visiting someone who does. Plus, the infrastructure around them needs to be upgraded first. Considering they were worn for 25 times or so, it's not that surprising. Dad isn't one for dressing up. 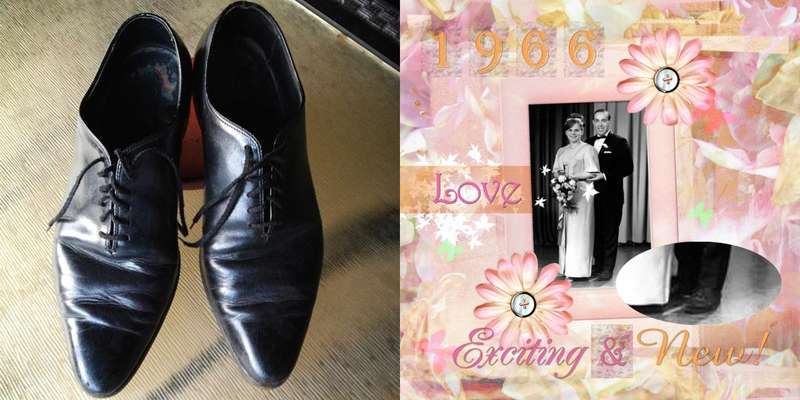 Once he got married, he settled into more casual shoes! Awesome story CJ. Practicality and frugality - something we don't see much of these days. Bet your dad influenced your perspective on etiquette and respect for others. Think we could convince him to wear them on the GO for a pic with his feet up on the seat? Priceless!